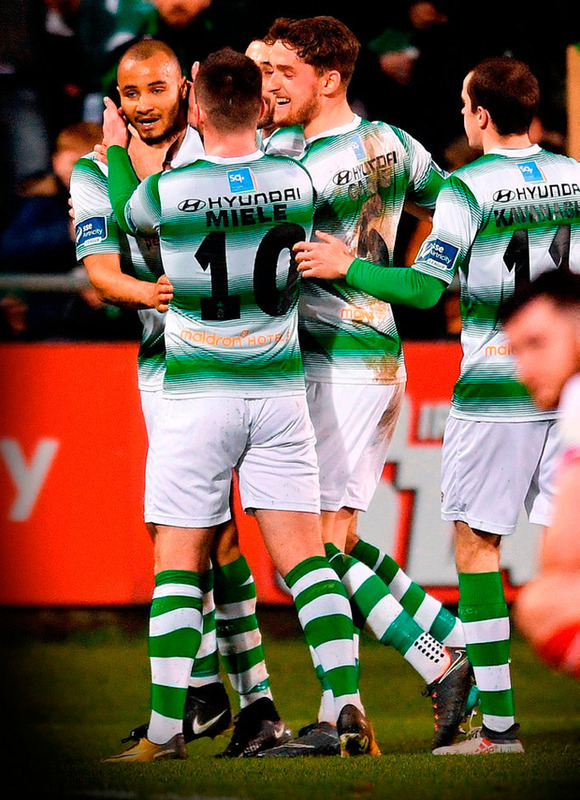 It was not to be St Patrick's night for their cross-city trip to Tallaght as a self-inflicted wound ended their unbeaten run and set up an enjoyable weekend for Shamrock Rovers supporters. Despite the intensity of their rivalry, Rovers and St Patrick's Athletic simply cancelled each other out for long spells of this league battle last night, but there was also the hint that either one moment of genius, or a mistake, could swing things. And so it turned out that Rovers got their goal, and their win, 13 minutes from time due to a slip by the away side. A cross into the box by Rovers defender Ethan Boyle appeared to have little in the way of a threat but Saints defender Kevin Toner, so reliable to date this season, sliced his clearance, the ball crept past keeper Barry Murphy over the line, the Hoops finally breaking the away side's resistance. The Saints defence had been impressive of late, back to back clean sheets, but they now reset the clock and prepare for Monday's date with a free-scoring Sligo Rovers. Former Rovers player Murphy was having a relatively quiet night up to that point, attempts on target scarce for a healthy crowd of 4,200, but pressure from Rovers had been building in the last 20 minutes and the win was deserved, keeping them in the top four. Sparks often fly in this fixture, especially given the history of the game and the cross-over between the two squads, especially recent moves to St Pat's from Rovers for Simon Madden and James Doona. But there was a strangely tame air to events for long spells, this game at times more akin to a League Cup tie than a big league derby. Owen Garvan has been a key figure for Pat's since his ended his 15-year exile in England last season and joined the Saints, and once again he was the driving force from midfield. In fact the 30-year-old did his best to open the scoring on 17 minutes. Pat's were awarded a free kick for Trevor Clarke's foul on Simon Madden, Garvan swung in an effort which almost caught out Rovers keeper Tomer Chencinski and he had to stretch to make the save. Clarke was in action at the other end on 20 minutes, his cross creating an opening for Brandon Miele but his headed effort was wide. Rovers had their first shot on target on 26 minutes, in-form striker Graham Burke forcing a save from Barry Murphy. Just before half time Garvan was again a danger to Rovers, his cross met by the head of Conan Byrne but the attempt was too weak to trouble Chencinski. After a relatively tame 60 minutes, Rovers began to take a grip on things, notice of their intent when Ronan Finn dispossessed Garvan and fed Burke, whose effort was wide. Sub Ian Turner had added power to the Saints side but Rovers sensed the win, which arrived on 77 minutes thanks to that slip by Toner (inset) and then keeper Murphy. In fact Rovers almost made it 2-0, Murphy spilling a shot from Finn before the danger was cleared, but the one goal, that own goal was enough for the Hoops to set them up for Monday's trip to Limerick.